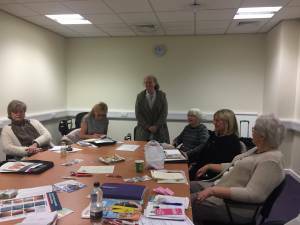 The meeting started promptly with a very informative presentation by Mary Liley who works at the Liverpool Heart and Chest Hospital, which is at the forefront in the UK for robotic chest surgery. The hospital provides world class specialist services in cardio thoracic surgery, cardiology and respiratory medicine and in 2016 the CQC rated it as “outstanding” which was the first trust in the country to achieve this accolade. Mary gave us an insight into the intricacies of robotic surgery and the benefits involved, not just by saving the NHS money in improved recovery time but the health benefits to the patient compared with regular heart and chest surgery. Mary also explained that the working life of skilled surgeons can be lengthened by the use of the robot and the procedures are so successful and accurate, patients can go home within as little as a day after surgery. The branch held a charity cake sale during the meeting and I’m pleased to say that we managed to raise £95.00 which we happily gave to Mary to help her charity work raising money for the hospital. 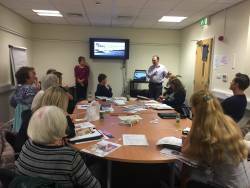 After a short break and a buffet arranged by Sian Williams, the meeting continued with a presentation by Steve McGowan about the fungal nail treatment his company makes called Emtrix. He went through the evidence to back up the claims about its success and continued by telling us about the improvements made to it since he last met our branch. His wife Caroline McGowan then took to the floor to explain the benefits of using Flexitol heel balm and foot moisturiser. There have been some new products released recently so we learned about them too. We would like to thank our guests who had travelled a long distance to be with us on a Sunday afternoon. The branch meeting started then, discussing the news and events since the last time we met. Our secretary Dawn Hinton outlined the roles each of the main key members of the branch have in case there was any doubt. Our treasurer Kevin O’Sullivan then discussed our recent expenses. The meeting concluded until we meet again in January 2019. I would also like to take this opportunity to say a big thank you to the members of the Western Branch who helped me raise over £1,250 for Claire House Children’s Hospice, by sponsoring me to do a wing walk.